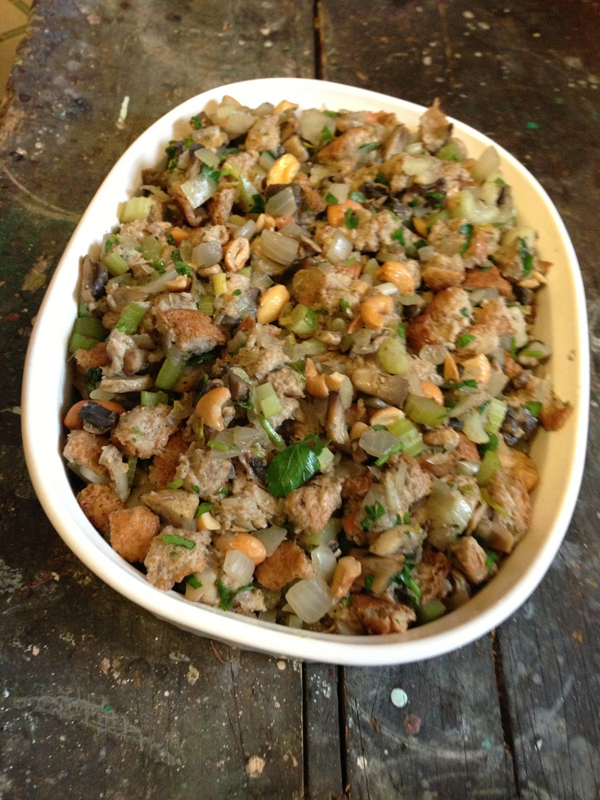 Stuffing is so delicious. It’s my favourite thing on the Christmas or Thanksgiving dinner table. 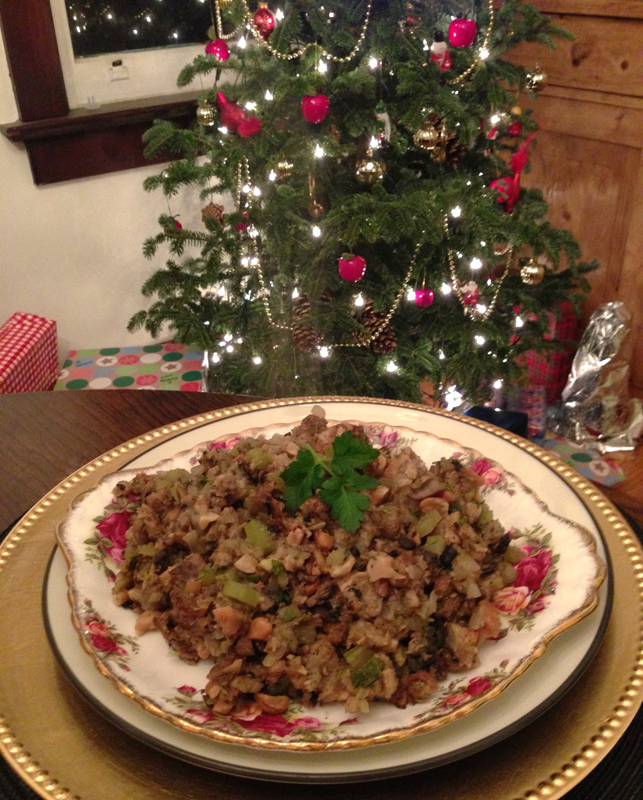 I could eat a whole plate of just stuffing. Add some cranberry sauce on the side and I’m in heaven! Since becoming a vegetarian I’ve been searching for the best recipe that doesn’t include bird, and after many tries I think I’ve finally got it just the way I like it. NO RAISINS (sorry Grandma), nice texture, strong herb flavour and a few nuts to add crunch. Give my recipe a try this year and let me know what you think! Happy Holidays everyone! Prep all the ingredients first. Preheat your oven to 400 degrees F.
In a large pan, saute the onion, mushrooms, celery and cashews in olive oil on medium heat until softened. Add the wine and cook until the wine has evaporated. Remove from heat, add remaining ingredients and mix well (bread should be moist). Grease a casserole dish with half the sesame oil, put the stuffing in and drizzle the rest of the sesame oil on top. Cover with foil and bake at 400 degrees for 45 minutes. 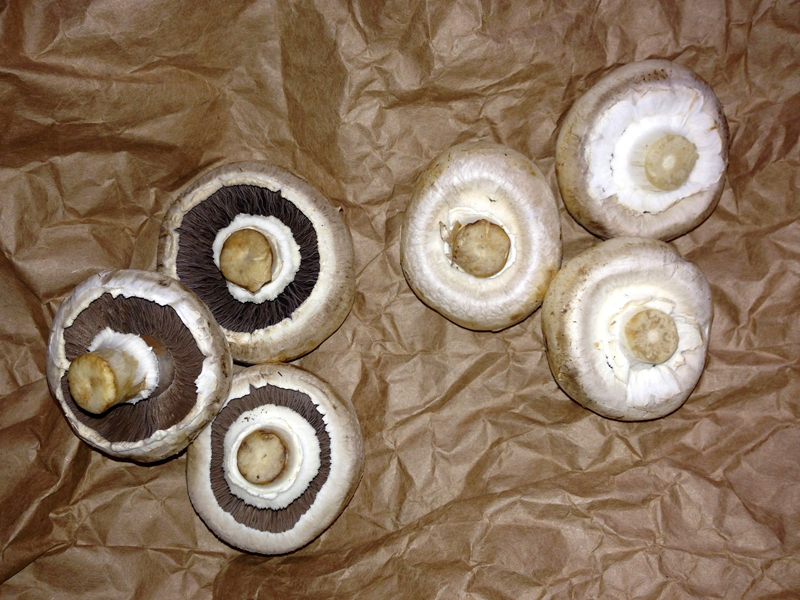 TIP: How do you tell if a white or brown mushroom is fresh? If you can see the gills, it’s not fresh. The mushroom should be closed like the ones on the right in the photo below. But it doesn’t mean you can’t use the open ones, they’re totally fine. It’s just a tip so when you’re buying them, you can pick the fresh ones so they last longer. Store them in the fridge.